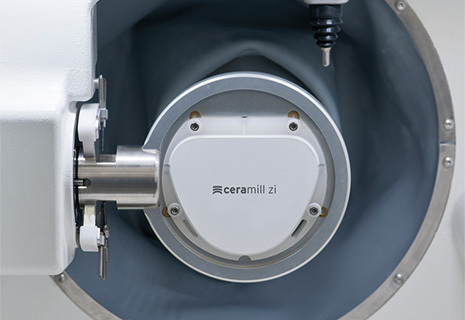 Ceramill ZI features high strength, rigidity and biocompatibility. 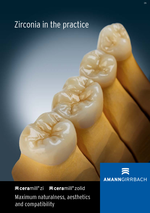 The presintered zirconia blanks have a particularly high flexural strength of up to 1400 MPa and can be processed without any problem thanks to their optimum edge stability. With an opacity value of approx. 70% Ceramill ZI is ideal for indications in which discoloured tooth preparations or metal frameworks must be masked as well as for the fabrication of support structures for fixed and removable prosthetic restorations such as crowns and bridges in the anterior and posterior regions, telescope and conical crowns, customised abutments on titanium bases and multiple-unit, screw-retained restora-tions on titanium bases. Ceramill ZI frameworks can be customised with Ceramill Liquid colouring liquids using the immersion or brush technique.